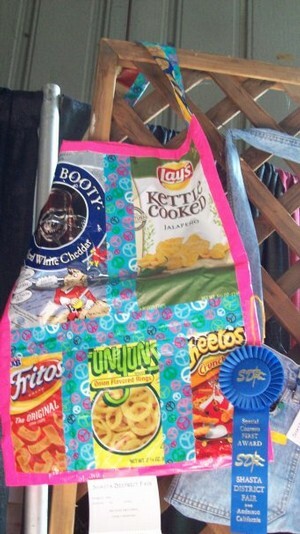 ﻿﻿﻿﻿This clever potato chip bag apron was one of the winners in the “Treasures from Trash” recycling competition held at the Shasta District Fair. How cute is that? And what a great use of bags that would otherwise be thrown away! This is a perfect project for sewing with kids - fast, easy and cheap. Also, what a nice gift for any summer occasion, such as Father’s Day or for use during the Fourth of July. So what are you waiting for? Bind the edges, and add ties to go around the neck and back. Voila! A cool apron for indoor or outdoor use! And what if you don’t have time to sew? You could just tape the bags together, finish off the edges and attach the ties with colored duct tape. Very cool idea! Thanks for sharing.